Merken...the indispensable spice of the native Chilean Mapuche families. Merken "Goat's Horn" Chile Pepper Spice - For centuries, natives of the Araucania region of Chile have prepared this smoky Chilean Merken Mapuche spice according to ancient Mapuche tradition. Merken is an essential & versatile spice. Key to Merken's unique spicy flavor is the indigenous Cacho de Cabra, or "goat's horn," chili pepper. 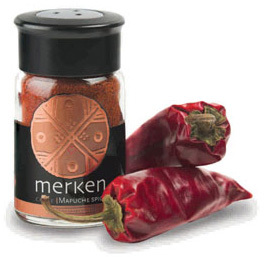 Merken is an all-in-one Chilean spice that can be sprinkled on fish, shrimp, poultry, beef, & vegetables. Merken livens up soups & sauces, potatoes, pastas & salads. Great for dipping with olive oil or sprinkling on nuts. Merken...a very versatile Chilean spice. At Chilean Gourmet it is their objective to support agricultural communities & traditions in Latin America. Through their purchasing practices they aim to raise the living standards for their producers & farmers while encouraging environmental stewardship & community investment. Merken Chilean "Goat's Horn" Chili Pepper Spice. Ingredients: Ground Cacho de Cabra ("Goat's Horn Chili Pepper"), Ground Coriander Seeds, Salt.